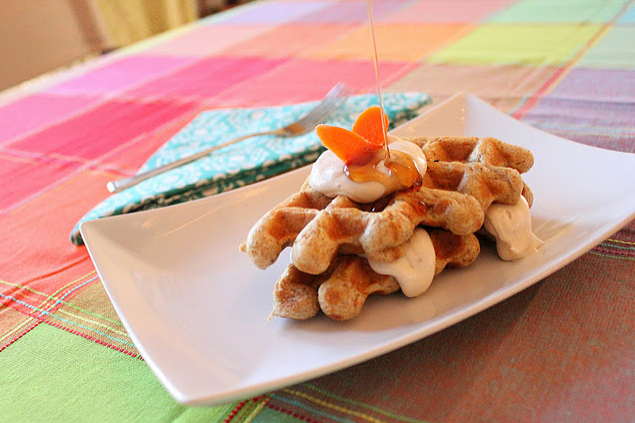 i should have just posted this along with my carrot cake waffle recipe on friday, but i didn’t. i had a feeling a couple of you were going to ask. so this is my go-to waffle recipe. it’s very simple, but it really works for me. begin by mixing all your dry ingredients into a large bowl. then mix all your wet ingredients in a medium bowl. add your wet ingredients to your dry ingredients. mix until just combined. this mix is easily doubled, tripled or quadrupled. i do it all the time. for my waffle iron (this is the iron i use except mine only makes four, not six) i like my mix on the thicker side. i also, as you can tell from the pictures, never completely fill up my iron. cleaning up waffle batter that has run over the side of my maker is probably one of my least favorite things. plus i love the look of the rough edges. you could even take a savory route and add in cheddar and jalapeño or sausage and swiss cheese. serve with some scrambled eggs and salsa and you have a great dinner in minutes! i also adjust my sugar amount based on what is going in the waffle. if i’m using cranberries i may add a little more … if i’m adding pineapple, maybe a little less . you can also use whole wheat flour if you’d like. i usually recommend half whole wheat and half all purpose. good luck! happy waffle making. so, i’m curious, how do you like your waffles? i’m always looking for new ideas! Hi Michael, found you via #discomania. So glad I did! I used to be a front office manager until I went on maternaty leave and I will definitely be following your blog! Oh and I prefere my waffles with nutella AND strawberry yoghurt. You must try this! 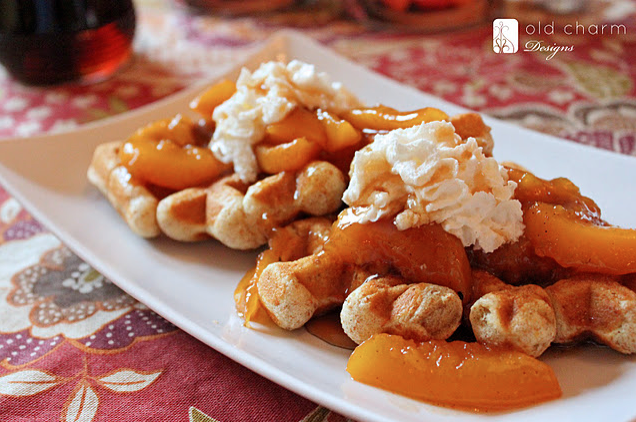 These look so good, I’ll take a waffle just about any way I can get it! Our go-to recipe is Waffles of Insane Greatness (if you google it’s easily found) and they are slap yourself good. We don’t even let it sit 30 minutes as instructed and they come out perfect every time. I tried your recipe today! LOVED IT. I did make some changes to it tho. If you are curious check out http://www.dreawood.com tomorrow after 8pm, I have a post schedule to go up with the changes. All 3 of my kids btw ate them too! so its a winner in our house. WOW! Those were sooooooooooooo yummy. I don’t know if you are familiar with The Pioneer Woman but she has gotten me hooked on using cake flour. I used it for your recipe. So good! Thanks for sharing.